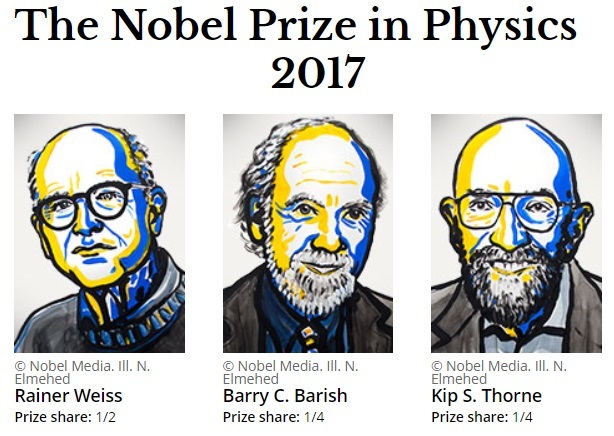 The Nobel Prize in Physics 2017 announced Today 3 October 2017. The Royal Swedish Academy of Sciences has decided to award the Nobel Prize in Physics 2017 with one half to Rainer Weiss and the other half jointly to Barry C. Barish and Kip S. Thorne "for decisive contributions to the LIGO detector and the observation of gravitational waves". 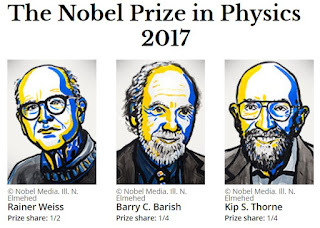 Prize motivation: "for decisive contributions to the LIGO detector and the observation of gravitational waves"
This year's Nobel Laureates in Physics have ensured that more than four decades of effort led to gravitational waves finally being observed. The Nobel Prize in Physics has been awarded 111 times to 207 Nobel Laureates between 1901 and 2017. John Bardeen is the only Nobel Laureate who has been awarded the Nobel Prize in Physics twice, in 1956 and 1972. This means that a total of 206 individuals have received the Nobel Prize in Physics. David J. Thouless, F. Duncan M. Haldane and J. Michael Kosterlitz "for theoretical discoveries of topological phase transitions and topological phases of matter"